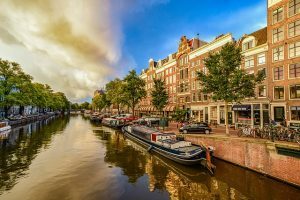 What are the secrets of Amsterdam city & De Jordaan? The Secrets: Like any city, Amsterdam is divided up into various neighbourhoods, each with their own distinct personality. Perhaps the most famous and desirable of these neighbourhoods is the De Jordaan region. Starting at Brouwersgracht (to the west of the city’s central station), looping through the Canal Ring and finishing up at Leidsegracht, De Jordaan is an inspiring and unique neighbourhood. Find out more about this beautiful part of the city by keeping to read on. What are the highlights of De Jordaan? The very streets of De Jordaan are an attraction in their own right. This neighbourhood is typified by winding, historic streets with cool cafes and galleries on almost every corner. Key galleries include the Keren de Vreede Gallery, the Annet Gelink Gallery and many more, offering both classic works of portraiture and some truly innovative contemporary works of art as well. In De Jordaan, you can also find some wonderful markets. Head down to Noordermarkt and depending on the day of the week you will be able to sample some fresh organic fare or browse the weird and wonderful offerings at a traditional Dutch fleamarket. The church in the De Jordaan region, Westerkerk, was mentioned by Anne Frank in her famous Diary. She reports hearing the bells of the Westerkerk floating across the air of the city. Another highlight of this neighbourhood is its unique spirit, students, families and hipsters all rub shoulders in this densely populated region. It may be compared to London’s East End, thanks to its innovative, community focused vibe. Discovering De Jordaan is so much easier when you have a comfortable, well situated hostel or hotel to stay in. The Amsterdam Hostel Sarphati is perfect for this as it is affordable and centrally located.